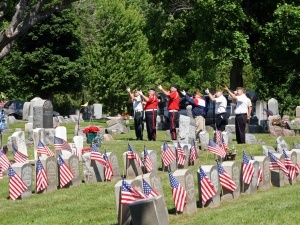 Following the weekend of celebration, the Birthplace of Memorial Day pauses to remember the sacrifices of those who paid the ultimate price for freedom. 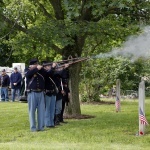 The 153rd solemn remembrance of Memorial Day in Waterloo will be observed on Wednesday May 30. 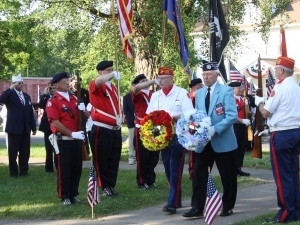 The American Legion will conduct this years remembrance events. Memorial Day is always commemorated on May 30 in Waterloo, in keeping with Gen. John A. Logan’s Orders. The solemn remembrance will continue at 6 p.m. when the military parade steps off from Main and Clark streets, proceeding down Main Street to Lafayette Park where several veterans organizations will participate in the laying of the wreaths at the veterans monuments in the park. 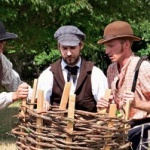 The program will include the recitation of the Gettysburg Address and Logan’s Orders by students from Waterloo High School, Speeches by honored dignitaries, the playing of the National Anthem by the high school band, Salute to the Dead gun vollies by the veteran led honor guard and the playing of Taps. 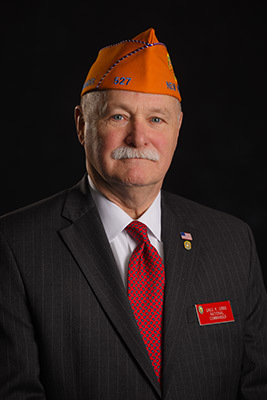 Greg “Doc” Gibbs was elected national commander of the Sons of The American Legion in Minneapolis, Minn., during the 47th national convention of the Sons of The American Legion. Greg “Doc” Gibbs was born in Buffalo, NY, the son of a World War II combat Marine. Doc comes from a three-star WWII family where his father and his two uncles all served in WWII and in Korea. Doc’s father served in the Pacific Theater in such hot spots as Bougainville, Iwo Jima and Tinian. The Marine Corps ethic had been passed down to both Doc and his younger brother growing up under some strict rules. Doc’s younger brother, Jeff, served in the Navy during the Vietnam War. Doc has served the Sons for over 19 years through the Hamburg Post #527 in Western New York and received an honorary life membership from his Squadron and Post in 2015. Hamburg is a suburb of Buffalo, NY and boasts the largest Post in combined Legion Family membership in New York. He is currently a tenured university professor and has served as a public school administrator, holding a doctorate/PhD degree from the University of New York at Buffalo in administration. As a tenured Associate Professor, Doc has chaired the Educational Leadership department and served as program director at St. Bonaventure University for the past 13 years. Greg served for several years as the only university faculty member on the “Veteran Friendly Campus Committee” at St. Bonaventure University since its inception, setting policy and making recommendations to the university to create a better environment for admissions candidates from the military and newly enrolled veterans and their families. His most recent activity has been as the Legislative Chairman for the Detachment of New York for the past 8 years. While serving as Legislative Chairman he was honored to receive the George B. Evans Grassroots Advocate of the Year in 2013 at the Houston, Texas convention from National SAL Commander Huntzinger (PA). Doc continues to serve on Congressman Christopher Collins (Rep.-NY) Veterans Affairs Committee. While serving as SAL National Vice Commander, Doc had the opportunity to attend the American Legion Congressional Hearing given by Legion Commander Michael Helm in 2014, sitting in place of Commander Michael Moss (CO). Doc has attended National NECs and Conventions since 2006 and has served as a committee member on the National Children and Youth Committee for several years, National Vice Commander from the East, and most recently as Chairman of the Americanism Commission under Commander Kevin Collier (AK). Doc has served as Squadron, County, and District Commander in the past years and has also served as Detachment Commander for New York in 2011-2012. He also served as National SAL Vice Commander from the East in 2014-2015 under Commander Mike Moss (CO). One of Doc’s proudest accomplishments was being the co-founder of the William P. O’Connell Memorial ROTC Scholarship from the New York District 7 and 8 Sons that is now in its tenth year, giving scholarship and recognition to a worthy cadet at two of New York’s universities that boost large ROTC programs (Rochester Institute of Technology and St. Bonaventure University). Doc received a National American Legion Award for his “contribution and impact to education” from National Legion Commander Paul Morin in 2006. He is a 9 year member of the Legion Riders, Orchard Park Post #567 and also proud to wear the colors of the 9-11 Memorial Post #2001 Riders Group as a charter member as well. Doc attended the New York Legion College in 2011, the first year the Sons were invited to attend. Doc has been honored to serve as a Legion College of New York Faculty member the past four years, the only SAL member to ever do so, co-teaching a session on legislation. Doc currently serves as the VAVS representative to the Buffalo, NY VA Hospital. Doc joined TALARC (The American Legion Amateur Radio Club) in 2011 when it first started. He holds a general license under the call sign WA2GKG. He has successfully completed the three NMI (National Management Institute) training sessions, the American Legion Extension Institute program, and the SAL 5 Star and 10 Ideals Programs. Doc organized and ran the Erie County, NY level Oratorical Contest for the Legion for several years. He has served as a judge at the National Oratorical Contest in Washington and sat on the first committee to help organize the National American Legion-Samsung Scholarship Alumni Association in 2016. 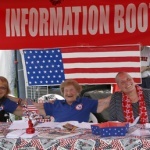 Doc is the Sons representative on the “Vets 4 Vets” Erie County American Legion Committee that is on a multi-year mission to build the first shelter for homeless women vets and their children in New York State. This concept differs in the fact that single mothers who are vets can seek shelter there with their children while they get their lives together and seek education and employment opportunities; all at no cost to the women veterans. His daughter and son have been members of the Legion family and he has been married to his wife Pam for over 44 years. Pam’s father, Albert Kramer II ,also served in the Army just prior to the Korean War. Doc and his wife serve as Rotarians with the West Seneca, NY Rotary Club and is also a 36 year member of Amherst Lodge F&AM #981 and a Shriner with Ismalia Shine of Buffalo, NY. Doc received a prestigious Paul Harris Fellow Award from West Seneca Rotary in 2013 for work with veterans and local community. Greg has served as President of the State University of New York at Fredonia Alumni Association for over 7 years and currently serves on the University’s Foundation Board as well. With his campaign motto of “Honoring the past…..Continuing the Legacy”, he truly looks forward to helping our national organization move forward and aiding the Legion as they approach their next 100 years of service to veterans, military, and our youth.